Efficient thermal insulation has so far focused on improving building’s envelope, understanding a building as a unique thermal space. Although it could be the case for some kinds of constructions, because of the more independence of each person and the concentration of people in multistory buildings, there are more partitions between different heated spaces and it makes us wonder about the relevance of thermal energy loses through these interior partitions. Aiming to answer this question, we divided our research into two main steps: first basic calculations of different building typologies, and developing an accurate virtual model to represent this phenomenon. In our first approach we looked for some numbers of what this yet-non-studied energy flow could represent to the whole energy flux in two different building typologies by using a monitoring system named SIRENA from Universitat Politècnica de Catalunya (http://www.upc.edu/sirena). How relevant are interior losses compared with losses through the building’s envelope? Are those losses hight enough to be studied and improved? The answer is rotundly “yes”! We concluded that this loses represents about a 20% of, what we named, a “Uni-Thermal-Zone Building (UZB) total loses and this value gets specially remarkable when rises to more than 70% in case of multistory and residential buildings, named as “Multi-Thermal-Zone Buildings” (MZB). Thus, according to our results, the significant percentage of heat lost through interior partitions indicate that they play a key role in a building’s thermal fluxes. As a consequence, we developed a DesignBuilder thermal model with different utilization patterns to analyze how this energy flow affects the interior comfort in a MZB, which are the south of europe most extended type of building, during one day and how the energy is lost. The results suggests thinking about “thermal sectorization”. Llorens, R.; Zamora, J.Ll. 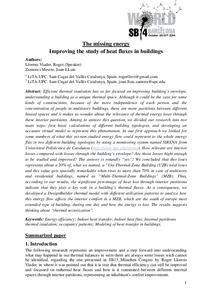 The missing energy: Improving the study of heat fluxes in buildings. A: World Sustainable Building Conference. "WSB 2014 Conference Documentation". Barcelona: 2014, p. Session 123.1.